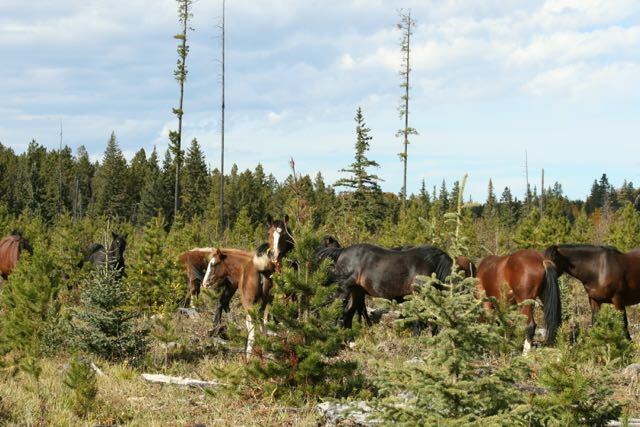 Throughout the year we follow the wild horses, checking on them and tracking their movements. It is heartbreaking sometimes when we know a horse has passed, but most of the time it is very heartwarming in a lot of what we are allowed to witness with them. 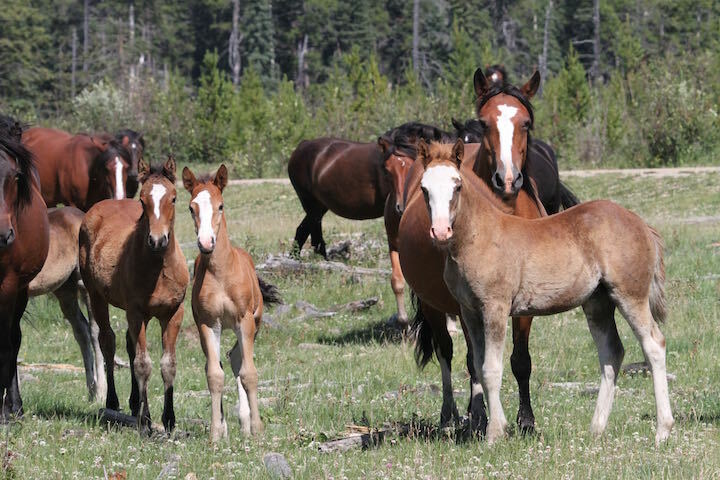 We would like to share a little story about some of the beautiful horses that we follow. We have been observing the young bay coloured boy, “Zephyr”, pictured above, since he was forced to leave the herd he was born into. 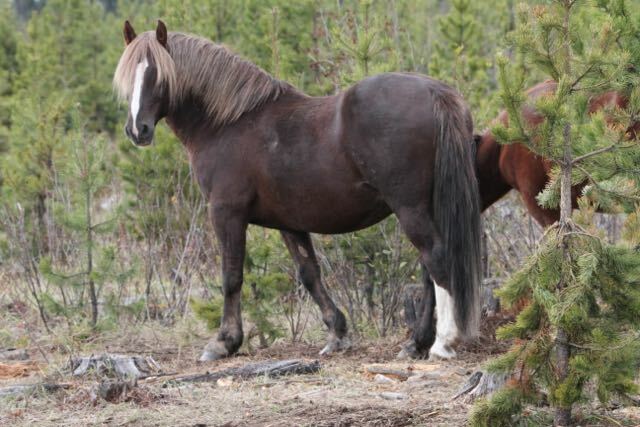 He has roamed through the hills, sometimes by himself and then at times he has joined up with other boys like “Goldie” he is pictured with here. He turned four this year which is the age that young studs are trying to start their own herds. 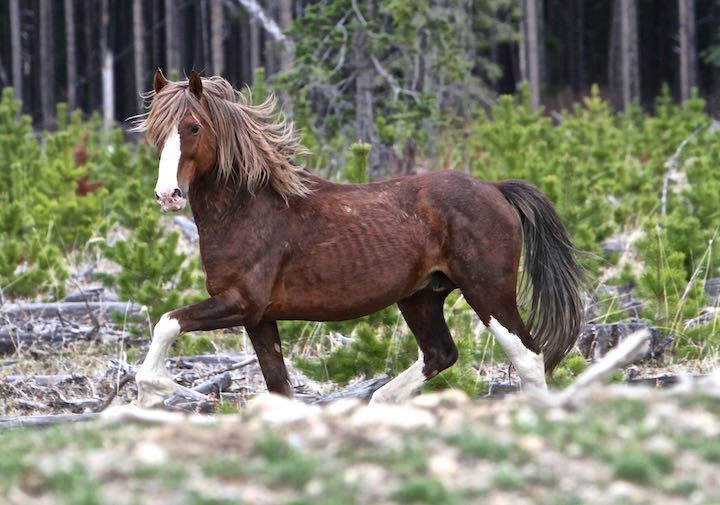 On of the most dominant stallions in this particular area is the one we call “Socks.” We have featured him many times in our calendars and in these story lines. He is a magnificent specimen and true patriarch in this area. Socks has sired many offspring over the years many who take on his colouring. This is “Socks Junior” who has grown, inhabits the same territory and has established quite a herd of his own. You can definitely see the similarities in the bloodlines. 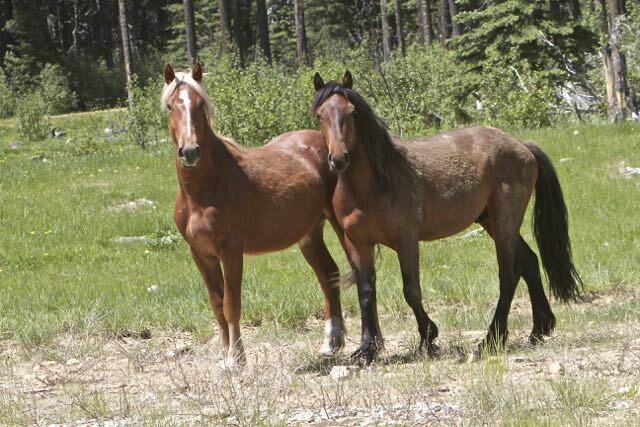 In the spring of 2015 one of Sock’s mares was scooped up by a large bay stallion. At that time she was pregnant with the Sock’s foal. Here’s the mare with her filly born in 2016. We have named her “Willow”. You can certainly tell who the sire was. As the year rolled along she continued to grow and thrive with her herd. 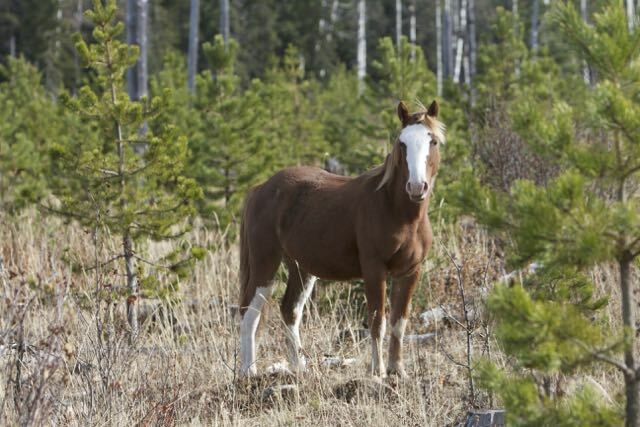 Her mother is a very protective mare and leads the herd. By the summer of 2017 she had certainly grown but was still with her herd. However, things were about to change as her mare had been bred by the new stallion and had foaled out a colt. 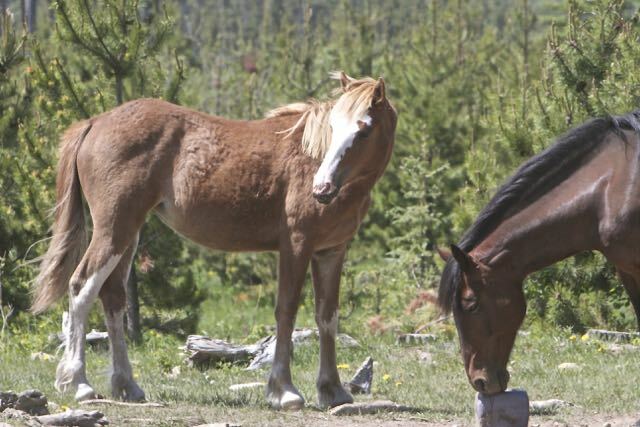 This foaling two years in a row is not a common occurrence with the wild horses but because the new stallion wanted his own bloodlines, she had been bred. Here is Mom with the new baby and our girl beside her. 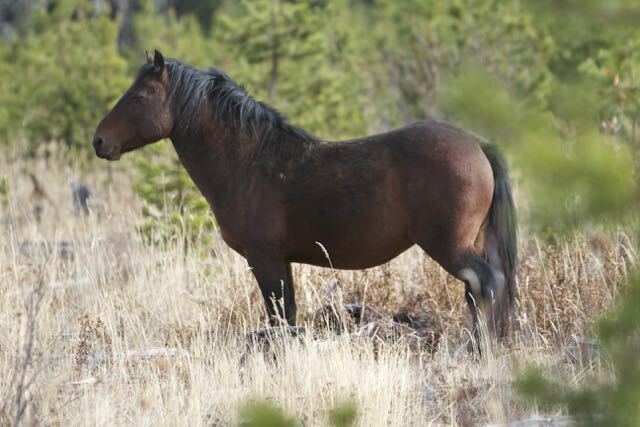 As summer came to a close her mare would have nothing more to do with her and because she was sired by another stallion, the herd boss allowed her to be chased out. Such is the dynamics of the wild horses. However being on her own was not to last long. “Zephyr” had never been too far away and it was thrilling to find him just the other day joined up with his new girlfriend. Oohh la la! Yeah! He was standing so proud with “Willow” feeding close by. He was not going to let anyone or any other horse near her! Right now she is too young to breed and they will just be together until she begins to cycle in a year or so. It will be interesting to follow these two. “Willow” looks to be content with her new circumstances and a strong stallion to protect her. 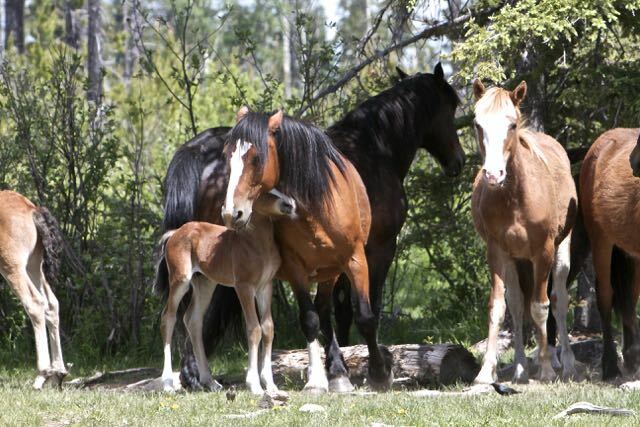 These are the heartwarming moments of being a part of the dynamics of the lives of our Alberta wild horses. Thanks for sharing the new photos. I always enjoy seeing them! Those encounters are amazing. Love the pictures. Hope Socks is ok he looks to be thin!